BiDiB is a protocol which supports P&P with a high reliability communication level. Rocrail is a BiDiB licensee. Only the Bus(ID) and the Address fields are used. Addressing starts in Rocrail with one; Null is not used. Port zero on the LC is in Rocrail address one. if sensor and input types at the same board exist the sensor range is 1 .. 128 and the input types are at 201 .. 328. Read/Write CV's on the main, POM, reported by RailCom® mobile decoders. 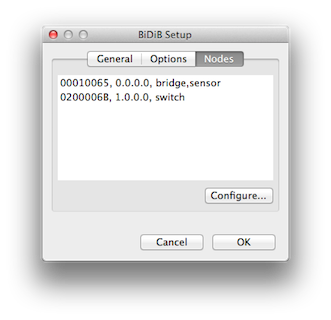 BiDiB & DCC Accessory control. All port types and macros. Typically COMx for Windows; Check the device manager. 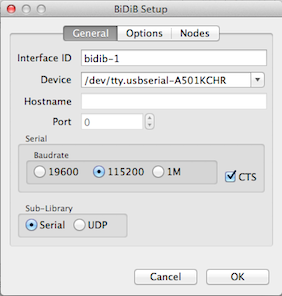 The FDTI is supported out of the box: use /dev/ttyUSBx for Linux based systems. 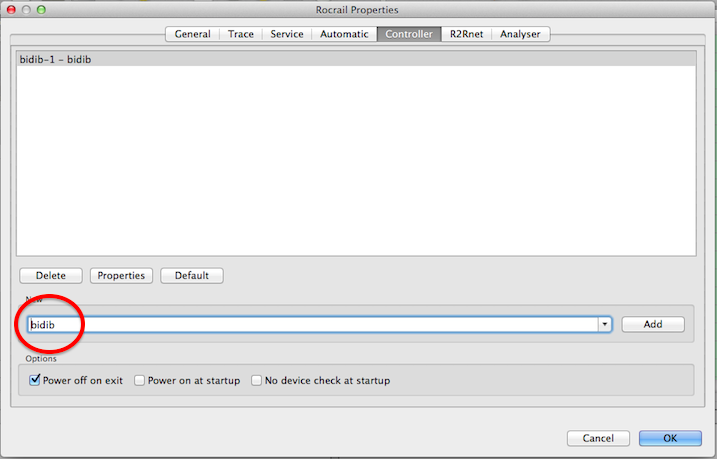 For Mac OS X the FDTI device driver must be installed: USB to Serial. After install and connecting the GBMBoost Master a new serial device is found under "/dev/tty.*". Host name or IP address. The current version of the GBMBoost supports 115200 only. Disable handshake only if the hardware does not support it. 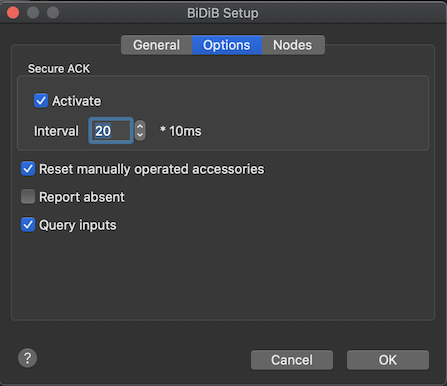 To activate the secure ACK option of the BiDiB protocol. If a manually operated accessory is reported, as error, Rocrail will try to reset it back to its last known state. The Watchdog Feature will be automatically checked at startup. The reported Location ID must mach with a Sensor-ID in Rocrail. The reporting address is used for the sensor Code. IRM only reports arrival and not depart, so for automatically reset use the Sensor Timer. It is recommended not to add or remove BiDiB modules to/from the bus in automatic mode because this will cause a lot of communication traffic and leads to strong delayed events. The track power will be shut off in case a module is reported as 'lost'. Starting with firmware 2.1.4 the GBMBoost Master can be used as Programming Track. Before programming on the PT the PT-Mode must be set, see the PT Button on the Programming Tab. Here are decoders listed which are not conform the RailCom specs. Max. 4 in the same section.